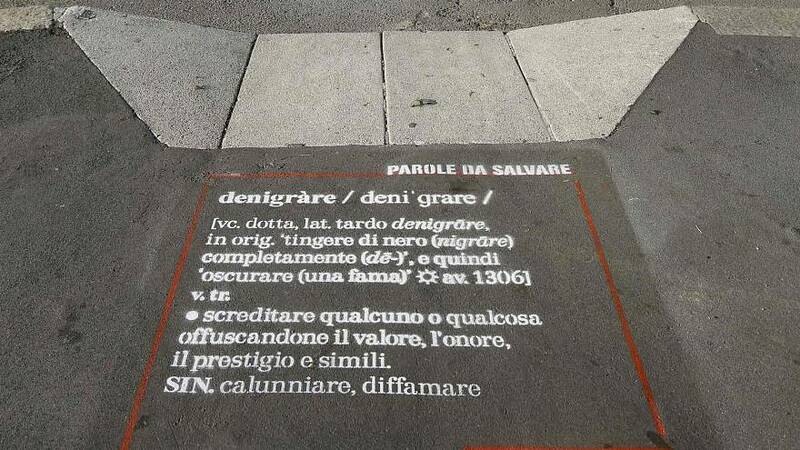 An Italian publishing house is using street graffiti in a bid to save lesser-used words from extinction and help bring them into popular discourse. The Bologna-based Zanichelli publishing house says words “full of nuances and expressiveness...are ending in oblivion because the current language prefers their most common synonyms”. Zanichelli’s marketing director, Gianluca Orazi, told Euronews that the group wanted to show people the most ancient and interesting Italian words that are no longer likely to be used in daily conversation. “We knew we had to find a way to show this and not in a normal way...To put this in the street is an original way to show the content,” he said. Editors at the publishing house chose five “words to save”, which are now sprayed onto streets in the cities of Turin, Milan, Padua and Naples along with their definition, and the hashtag #laculturasifastrada. The five words are: Bòria (conceit); Denigràre (disparage); Insìgne (distinguished); Solèrte (diligent); and Corroborare (corroborate). Orazi said the reaction to the campaign had been “very good”, with many Italians sharing pictures of the graffiti on social media. “All the people speak about this with enthusiasm and they want to be contacted and to put this graphic in their cities," he said. The campaign also seeks to promote other words, including literary, foreign and untranslatable terms. The eco-friendly paint will be removed in two weeks, but Orazi told Euronews that Zanichelli hoped to extend the campaign to other Italian cities in the future.